Another day, another custom quilt to share! 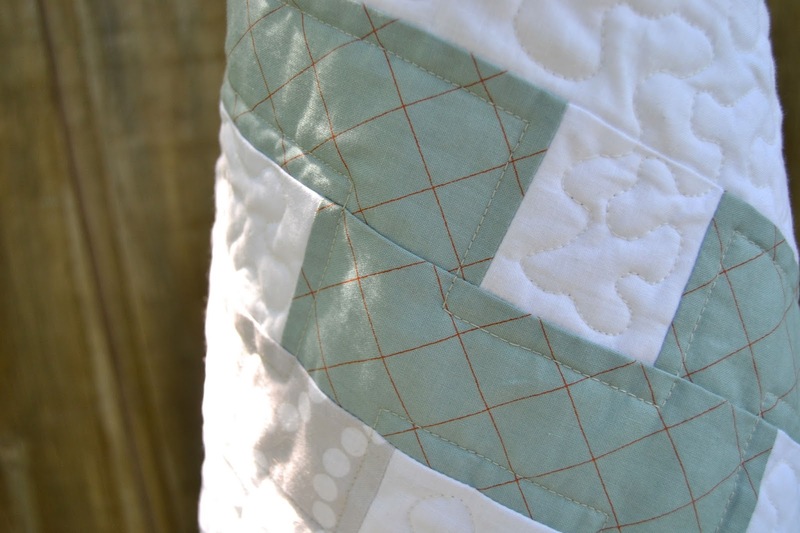 My client was looking for a show-stopping custom quilt for a very close friend's baby shower. I was relieved when she told me she was able to sneak a few clues about baby boy's nursery, which always helps me decide on colours and design, especially when I'm creating for someone I've never met. Quilts can be so personal! Assignment: sew a baby quilt to go with this pillow. I initially had a hard time finding the right shade of muted turquoise to coordinate with the cushion. And the fact that it was for a boy added another layer of challenge - there are always so many more options that involve florals or more "girly" prints. I spent the better part of an hour at my local quilt shop (the fantastic Greenwood Quiltery) before I settled on this combination of blues and greys from Doe by Carolyn Friedlander, with some grey Widescreen (which I also used for binding), a blue kite tails print from Lotta Jansdotter, and grey Pearl Bracelets from Lizzy House. I initially wanted to mix in some pops of yellow, but decided to be conservative based on my (fairly baseless) assumptions about the quilt's recipient. Hilary from Greenwood agreed (and we had a little too much fun inventing a backstory for these people and what they would like based on their cushion choices...), so we played it safe and stuck with blues and greys. I quilted it with a mix of free motion stippling and straight lines, to soften the strong geometric lines and emphasize the pattern. 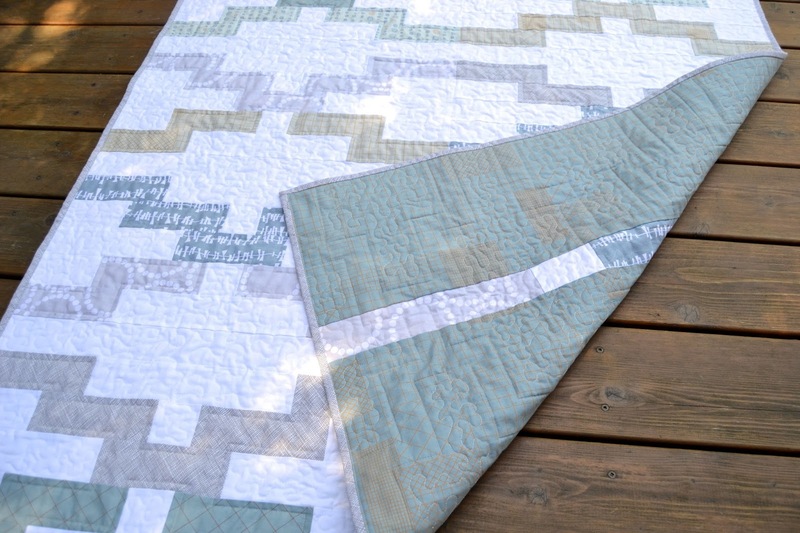 I waffled a bit on how to quilt it (I always do), but I think it turned out nicely. 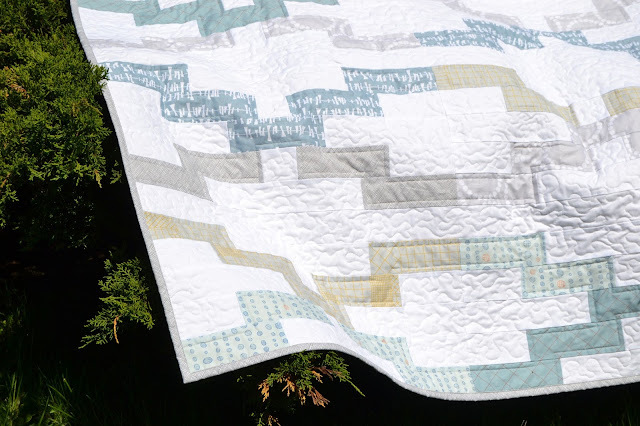 The Interlock pattern was well-written, and the quilt was simple to cut and piece and fun to put together. 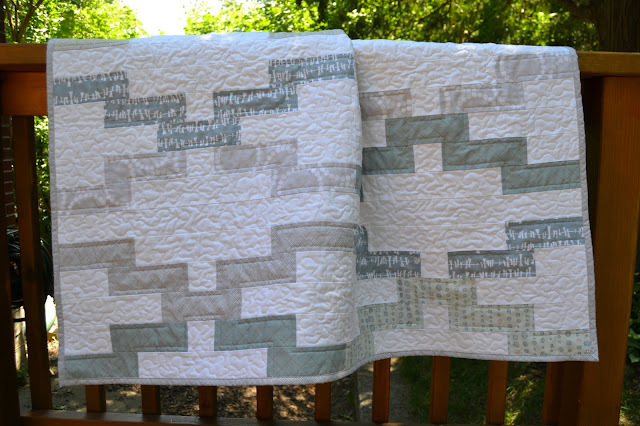 I don't often make the same quilt twice, but I can see myself using this pattern again. With a few changes of colour and fabric, it could look like a totally different quilt... scrappy colourful background with white/grey/low volume lines, anyone? I'm pretty confident that once Amy releases it herself, this one's going to be a huge hit. 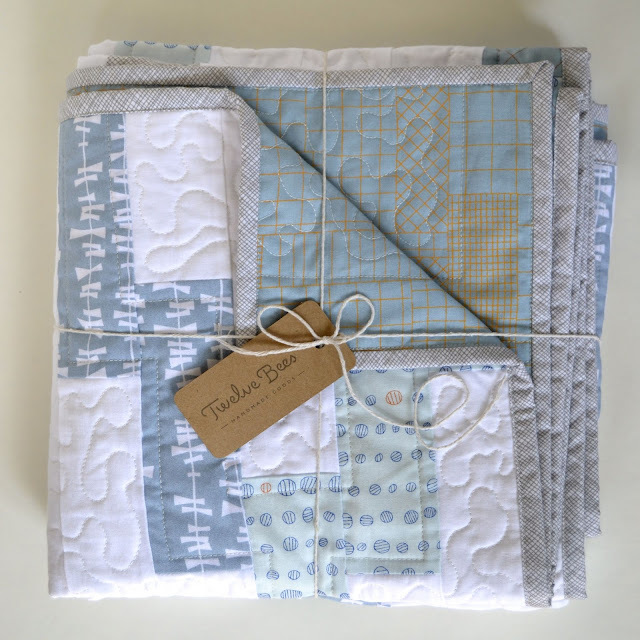 Such a stylish baby quilt, I'm sure it will get years of use and be much loved. I really admire you taking commissions and making a business of your quiltmaking. 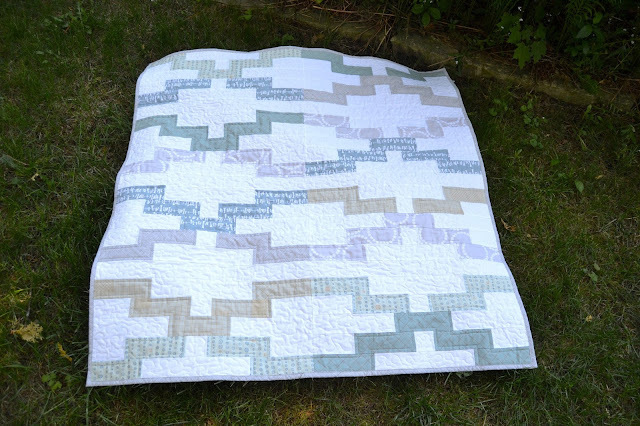 Your finished Interlock quilt is just lovely. I've only just now purchased this pattern and intend to make it using a Zen Chic Reel Time Jelly Roll.